A humorous story about accepting help from friends told in very few words and wonderful illustrations. Ninja Bunny was written and illustrated by Jennifer Gray Olson, published by Knopf Books for Young Readers, 2015. Study this one if you want to see how to write a compelling story with few words. I liked the structure of telling a story through a list of rules. This is a really good example of how illustrations and text work together. The illustrations add so much! 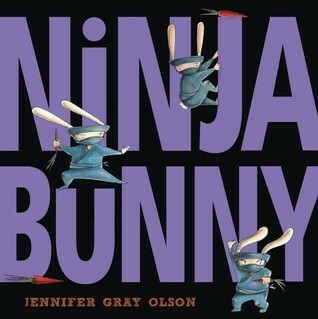 Find out more about the idea for Ninja Bunny in an interview with Jennifer Gray Olson by Matthew Weiner at Let's Get Busy. The idea of ninjas always makes a lesson more exciting for students. With this book you can discuss how sometimes it’s a good idea to ask for help from friends. This would be a nice companion to Sesame Street’s Biscotti Kid video where Cookie Monster uses karate principles to teach students how to listen with their whole body. Discuss why or what is means to co-operate. Create a poster or list of rules for how to be a good (ninja) friend. Have students illustrate one "ninja rule" for the classroom. This looks so cute! And there are so many wonderful ninja books out now. I'm so glad you mentioned Corey Rosen Schwartz's book. Her Three Ninja Pigs, is just as much fun and she's a master of rhyme. I know! As a teacher, I always like it when I can find books that have similar characters or concepts, both because students get interested and also because we can talk about similarities (and differences).